Classic Film and TV Café: This Week's Poll Goes to the Dogs--the Disney Dogs! This Week's Poll Goes to the Dogs--the Disney Dogs! 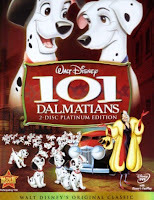 One Hundred and One Dalmatians (1961) – The very scary Cruella De Vil has Dalmatian puppies kidnapped so she can use them for a Dalmatian fur coat! Highlights: the “twilight bark”; the human/canine double wedding; the TV show parodies “What’s My Crime” (a favorite of the kidnappers) and the Kanine Krunchies jingle; and Dalmatians rolling in soot to disguise themselves as black Labrador Retrievers. Lady and the Tramp (1955) – Opposites attract when Lady, a sheltered, pampered Cocker Spaniel, meets Tramp, a scrappy mixed breed that lives in the streets. Highlights: Lady and the Tramp sharing a candlelight spaghetti dinner as they’re serenaded with the pretty “Bella Notte”; the sneaky Siamese cats singing their signature tune (“We are Siamese if you please; we are Siamese if you don't please”); and the marvelous dog’s eye view of the world throughout the film (ever notice that one rarely sees the humans’ faces?). Old Yeller (1957) – A large, stray “yeller dog” adopts a frontier family. The oldest of the two sons (Tommy Kirk) rejects the dog at first, but grows to love the loyal, courageous animal. Highlights: Yeller’s refusal to eat a tempting slab of meat hung in front of him all night long as a test; Yeller sneaking onto the bed of the younger boy; the tears-inducing climax; and Yeller’s pups…which look like Golden Retrievers even though Yeller was mostly a Lab. The sequel, Savage Sam, isn’t nearly as good. Greyfriars Bobby (1961) – This is the amazing true story of a loyal Skye Terrier who slept on his master’s grave in an Edinburgh cemetery every night for 14 years. Given that laws required an ownerless dog to be destroyed, the City of Edinburgh adopted Bobby. One of Disney’s least known dog films is definitely worth a rental. Highlights: Bobby’s first day alone in the city; the children in the orphanage watching for Bobby; and Bobby gradually endearing himself to the crusty cemetery caretaker (Donald Crisp). The same story was the basis for the earlier Challenge to Lassie (1949). The Incredible Journey (1963) – A Labrador Retriever, a Bull Terrier, and a Siamese cat (a nice one) are separated from their family and must trek 200 dangerous miles back home. There are no talking animals here (unlike in the 1993 remake in which we “hear” the animals’ thoughts). Instead, there’s some narration (which makes it seem like a documentary at times), a trio of impressive canine and feline thespians, beautiful landscapes, and a porcupine. Those are your candidates! Confer with your pup, if you have one. I’m not sure feline advice would be unbiased in this case (I imagine they’d favor 101 Dalmatians and Incredible Journey, which feature nice kitties…as opposed the conniving Siamese twins in Lady and Tramp). I'm not much of a dog person, but I've always loved Old Yeller. Now if you had a cat poll, I would be in my element. I would have to vote for the 2 Siamese cats. They have always been a favorite. I'm a dog person (who likes cats, too...and birds...and horses), and to have to choose btw Old Yeller and Lady and the Tramp was torture! But they're all xlnt movies and each deserves the great write-up you gave them, Rick. I'd love a dog film marathon or festival (also cats, Becky...and other creatures). What a great poll! I think this is a ruff one, even for Toto! Rick, you highlighted many of the very moments that touched my heart in each one. Ultimately I chose to vote for "Greyfriars Bobby" because my guess is that it is the least known candidate. It is a truly heartwarming film and should be watched by anyone who dearly loves dogs. i never heard of Greyfriars Bobby! Interesting! GREYFRIARS BOBBY is a very sweet pic, Tom. My wife and I came across it at a video store several years and rented it because we were in a Disney mood. It was filmed on location and features a fine cast: Donald Crisp, laurence Naismith, and Gordon Jackson (from UPSTAIRS DOWNSTAIRS). I have to vote for Lady and the Tramp. I used to have a buff Cocker Spaniel. What a wonderful friend he was.